Its been a strange , and mild fall this year . We still have a small group of migrants visiting our front and backyard that on previous years would be on their way south by now. We got some snow , but for the most part, it is mostly thawed. The lawn in our backyard is still nice and green, and there are many leaves still on the trees ! This weekend it is supposed to get up as high as 14 degrees, so I guess we shouldn't complain ! Over the past few days we've been lucky enough to have a variety of backyard visitors, including my favourite , the Fox Sparrow. A species we've not had in our yard for nearly 5 years. Some nice recent findings since my last post have been a group of Whooping Cranes, a Brown Creeper, Rusty Blackbirds and a Northern Hawk Owl, but they will have to wait until next time. Don't envy you with the snow mate. None here, yet, and hopefully not for a while. Beautiful shots as always. Such a variety of 'sparrows' you have there. You don't post often but when you it is just marvelous. I love all the shots, but my favorite is the second one with the snow. It give a very nice effect on the shots. I've not seen any of these birds in my life... Maybe the next big storm coming from you are will bring us some. I've seen a yellow warbler recently after the big storm we got!! Here is Chicago we are having a very frigid autumn so far! 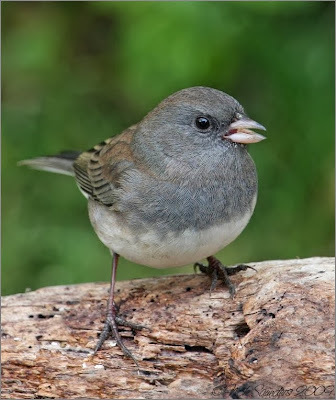 My favorite picture is the last- I love dark-eued juncos. Also I have seen a bird in my backayard in Chicago a lot but I don't know what kind of bird it is. A picture is here: http://sites.google.com/site/urbanbirding/Home/what-s-this-bird Can you please help me I've been stumped for a long time. Also they come in the summer and fall not only in the winter. I am awaiting the arrival of WCSP & FOSP in the yard. But not ready for snow! Nice series on sparrows. I never realized that there were so many different sparrows. Love your calendar Nick. I always marvel at your pictures.Each one has such clarity.Guess I need more practice or some lessons. Thanks for the great pictures, Nick. I really enjoy the sparrows here in the midwest. They like to live outside malls and in places where no other birds are around so I see them when I go to the grocery store and movies. They are so cheerful and active and there are always quite a few of them together. Your pictures are great as always -- you show so much of the character and life in them. Thank you! 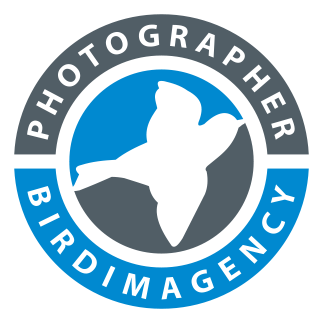 Kinga, Your backyard birds are Eurasian Collared Doves. We have a nice little population of these here in Saskatchewan now. 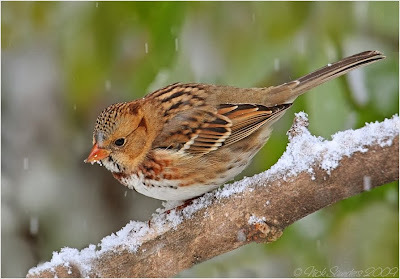 I love bird photos in the snow. 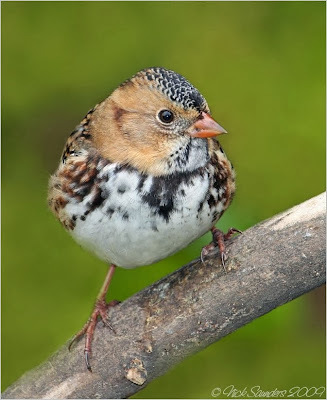 I especially like your portrait of the Harris's Sparrow. It great when they can get a good look at us too. Its an exchange of our personal Nature. Nice selection of Sparrows Nick. The 2nd pic of the Harris's is my particular favorite. Temps have dropped over here but more rain due any moment and the backyard birds are in hidding! FAB. Nice shots! 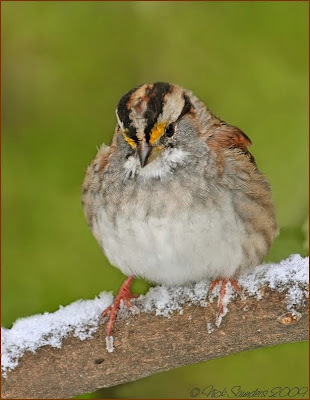 Love the Harris Sparrow - handsome bird. We don't get to see them here in Vermont. 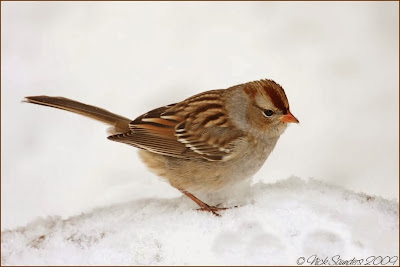 ...I love sparrows and your photos of them are stunning. 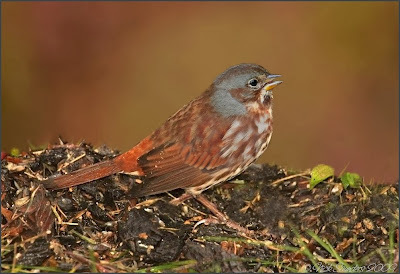 Earlier this year I read a book on Harris's Sparrows and fell in love with them. Unfortunately, they are out of range for my area. One of these days I hope to find one. I'm just going to have to get in the car and drive a bit. Wonderful photos. I really like the owl.